L.O.L. Surprise! fans will feel right at home in the L.O.L. Surprise! Cottage Playhouse. 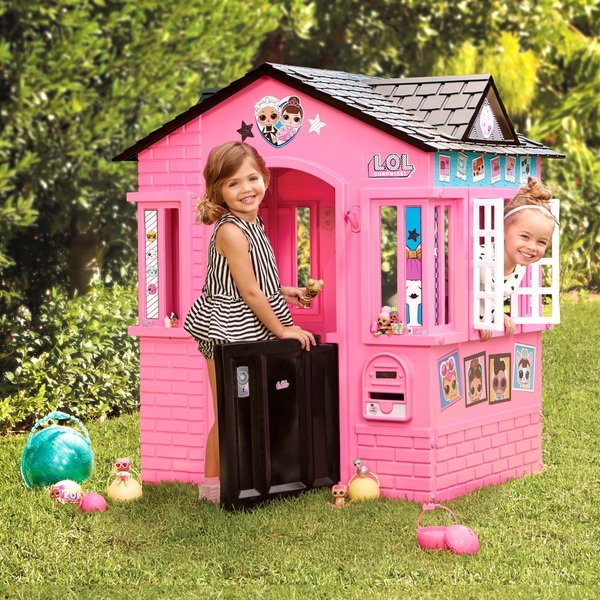 Pretty in pink and sparkling with glitter, this playhouse is perfect for role play fun. The front and back doors really open—and little ones can even open and close the shutters to peek outside. The L.O.L. Surprise! Cottage Playhouse is decorated with decal stickers featuring your favourite L.O.L. Surprise! characters for even more outrageous cuteness. Playing in this beautifully designed cottage is just like having a home of one’s own—you can even post letters through the detailed mail box. The L.O.L. Surprise! Cottage Playhouse combines style and fun, making it the perfect space for role play and storytelling adventures. Modern windows, brick details and a dormer roof give this colourful cottage a whole lot of character. There’s even a flag holder kids can use to add their own arts and crafts decorations. The L.O.L. Surprise! Cottage Playhouse is suitable for both indoor and outdoor use, andcomes with everything you need to assemble the perfect cottage. Flag not included. EU Warning: This product is intended for outdoor domenstic use only.